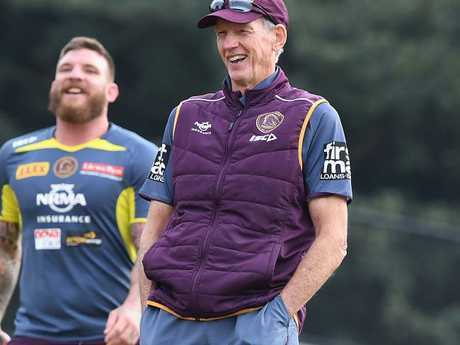 BRONCOS coach Wayne Bennett has been largely snubbed by NRL players, who have voted overwhelmingly to declare Storm coach Craig Bellamy the game's greatest mentor. 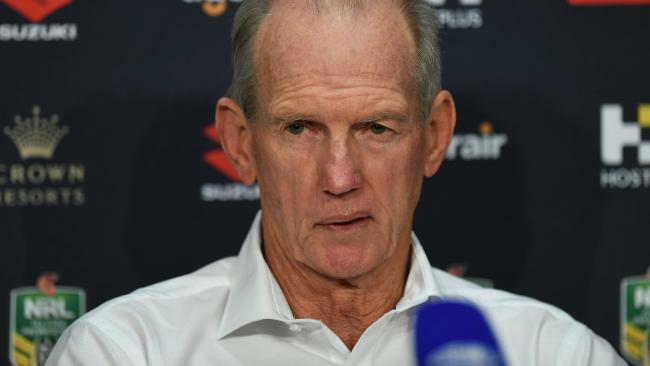 As Bennett's uncertain future at the Broncos continues to dominate headlines this season, the seven-time premiership-winning coach has received just eight per cent of votes in a poll of 117 NRL players from across all 16 clubs. The NRL.com 2018 Players' Poll shows Bennett is considered the third best coach in the game, but has been blown out of the water by Bellamy and Wests Tigers coach Ivan Cleary. Bellamy's status as the game's best coach has been reinforced by the 2018 NRL.com poll - where he received 48 per cent of the votes. Cleary received 17 per cent of the vote. Cowboys coach Paul Green (four per cent) and Warriors coach Stephen Kearney (four per cent) also finished in the top five. "Wayne Bennett will go down as one of the greatest coaches in the history of the game, but it appears his aura may have taken a hit among the current crop of players," NRL.com reported of the survey results. "Wayne Bennett is regarded by many as the greatest coach in the history of rugby league, but perhaps the constant scrutiny over his future this year has somewhat battered his reputation." The poll, taken under the condition of anonymity, also showed Storm star Billy Slater was still considered the best fullback in rugby league among his peers - receiving 60 per cent of the total vote on the best No. 1 in the NRL. Craig Bellamy, voted the NRL's best coach, and the Broncos' Wayne Bennett. Knights sensation Kalyn Ponga is already considered the second best fullback in the game, getting 11 per cent of the vote. NSW playmaker James Maloney was the clear winner with 36 per cent of the vote in the category for best five-eighth in the NRL, while Johnathan Thurston was crowned the game's best halfback and Storm superstar Cameron Smith was still considered the best No.9 in the NRL, according to the poll. Bennett's surprising slump in the eyes of NRL players came after rugby league Immortal inductee Mal Meninga earlier this week cautioned the Broncos against keeping Bennett in an official capacity after his contract concluded at the end of the 2019 season. Meninga urged Brisbane to make a "clean break" and block Bennett's mooted bid to become the NRL club's head of football. According to reports, the 68-year-old has requested a one-year contract extension at the club and also submitted his succession plan proposal to the board last month. Meninga said the next Broncos coach should be allowed to "do his own thing", something he couldn't see happening with Bennett watching over him. Wayne Bennett’s future remains the biggest story in rugby league. Brisbane has delayed a decision on the issue until season's end in a bid to quash the speculation swirling around Bennett. But Meninga told Fox Sports' Queenslanders Only: "If you're going to make a break from Wayne Bennett (as head coach) you've got to make a break. "I'm thinking Wayne's been such an instrumental part of that club right from the beginning that you probably need to have a clean break and give an experienced coach an opportunity to do his own thing with the club. "It is a club steeped in great culture and history and it's probably one of the biggest brands in Australian sport as well so it's a huge role to take being head coach of the Broncos." In his 25th season at the Broncos helm, Bennett called out Brisbane's board last week by demanding a decision on his future after the latest rumours linked South Sydney's Anthony Seibold to the club. 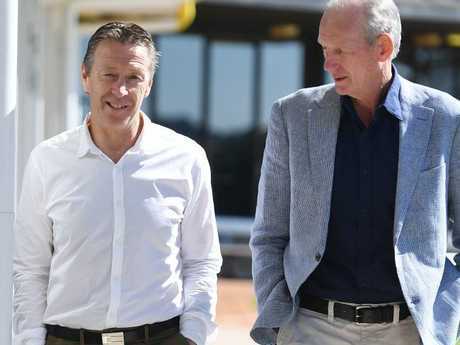 A day later, Bennett made a brief statement that he had agreed with the board not to make any more comments about the club's coaching future until season's end. Meninga said the Broncos had made the right decision to "nip it in the bud" and delay a call until October.